Fried chicken necks, convenience store sandwiches, and a whole lot of Asian comfort food. 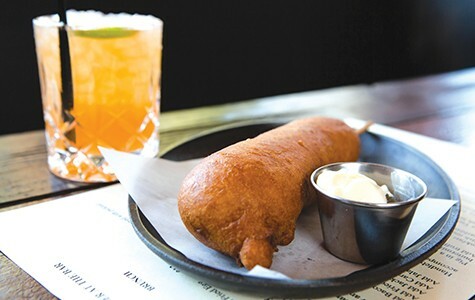 The breakfast corndog at Handlebar is beyond decadent. One of my favorite holiday traditions is compiling my annual list of top ten East Bay bites. It's a time to scroll through hundreds of blurry cellphone food pics and make myself very, very hungry in the process. For whatever reason, this year's batch of favorites skewed heavily toward Asian comfort food — steaming bowls of soupy noodles and the kinds of dishes best enjoyed over white rice. With apologies to the steamed surf clams at Great China and the tsukune at Ippuku, I limited my list to East Bay restaurants that opened within the past twelve months, with a couple of notable exceptions. Here are my picks, arranged in rough chronological eating order. If you took all of the ingredients in this dish — the sweet raw Hokkaido scallops, marinated salmon roe, lobes of uni (sea urchin), and seaweed-infused ponzu sauce — and served them to me fruit-salad-style, out of a paper cup, I'd still be happy to eat it on a daily basis. The fact that chef Shotaro Kamio's creation is also plated as beautifully as a piece of gallery-worthy abstract art is the cherry — or the, um, uni — on top. For anyone who loves the briny, umami-laden flavors of the deep sea, this is about as luxurious as it gets. At Kingston 11, the lively Jamaican joint that has quickly cemented its place as one of Uptown Oakland's gathering places, the crowd favorite is probably chef Nigel Jones' succulent, smoky-as-all-get-out version of jerk chicken — which, truth be told, would also be a worthy selection for this list. But the dish I keep coming back to is the curried goat (available Thursday through Saturday) — a dish that's so well seasoned, with the meat slow-simmered to such lush, tender perfection, that even diners who don't think they like goat meat will likely become converts. This year saw a mini-revival of Taiwanese cooking in Oakland, with the openings of Taiwan Bento in Uptown and Dragon Gate in the Jack London neighborhood. The latter is a loud, gaudy kind of place with swank karaoke rooms and servers bedecked in slinky, thigh-length Mandarin gowns, so it was a pleasant surprise to find that the restaurant's Taiwanese dishes were so homey and comforting. Perhaps my favorite was the charmingly named "idiot" noodles, which combined yusong (dried-fish floss), assorted pickled vegetables, half a soy-sauce-braised egg, and a Bolognese-like braised pork belly meat sauce — so many satisfying flavors and textures in a single bowl. In a city that's positively teeming with beer-friendly eats, The Dock sits at the very top of my current list of go-to spots to grab a brew and a few plates of tasty food. As conceived by chef-owner James Syhabout, The Dock adheres to no stylistic or national boundaries, so one visit might yield crinkle-cut fries topped with Texas-style queso while the next offers head-on shrimp grilled on the plancha in the manner of a seaside tapas bar in Spain. Best of all was this bowl of clams, bacon, and fresh napa cabbage kimchi in a fragrant broth. Because the kimchi was fresh, not fermented, the overall effect was supremely mild and soothing — just the thing to ladle over a big bowl of rice. Bun Mam Soc Trang has been around for a few years now, even if it's little known outside of the local Vietnamese community. But this noodle shop hidden in an obscure stretch of East Oakland was probably my favorite discovery of the year, so it seems only fitting to give it another shout-out. As great as the restaurant's namesake noodle soup — the bun mam — is, one of my favorite bites of the year was the restaurant's version of bun rieu — a rice vermicelli soup that featured silky cubes of pork blood, cloud-like pork meatballs infused with all of the rich juices from a crab's head, and a hit of pungent mam ruoc (fermented shrimp paste). At Handlebar, brunch — served Saturday through Monday — is the most decadent meal of the day. And the most decadent dish of all is chef Roland Robles' take on a pig-in-a-blanket: an oversized breakfast sausage that gets dipped in pancake batter, deep-fried, and served on a stick, with plenty of maple syrup-infused butter for slathering. Those who truly want to go big should order this object of all-American ingenuity with a side of the best hash brown patties in the East Bay. Not to take anything away from the American South, but it's a well-established fact at this point that Koreans know how to fry chicken as well as anyone. Hence, The Half Orange's most triumphant creation, Korean-fried buches, which combines a popular Tijuana taqueria's love of the chicken neck and the Korean cook's precise double-frying technique. The result? The gochujang funk and unparalleled crunch of Korean fried chicken, plus the tactile pleasures you get from gnawing away at a chicken wing until you've stripped off every last bit of skin and meat. Add a cold beer to the mix, and you've got a match made in heaven. Here's another spot that has been around for a few years, but was such a fun discovery — given its hidden-away, back-of-a-convenience-store location — that I wanted to highlight it again. If you only visit owner Norma Muñoz's little deli counter one time, the dish to eat is one of her compact, well-griddled pupusas, each one made to order by hand. But if you're lucky enough to stop by on a Saturday or Sunday, you shouldn't pass up on the opportunity to try Muñoz's weekend-only menudo. Rich, clean-tasting, and chockfull of tripe and beef feet cooked until they're unspeakably tender, this was one of the best bowls of menudo I've ever tasted. Indeed, this has been quite a year for the inside-a-convenience-store genre of restaurant, which also introduced me to some of my favorite sandwiches of the year: Ian De Leoz's banh-mi-inspired creations, sold from the deli counter in the back section of an Uptown Oakland vape shop. Almost all of De Leoz's sandwiches were worthy contenders, but I was particularly smitten with his pork adobo sandwich, which combines his mother's traditional adobo recipe, fork-tender pork, and a sambal aioli that added just the right touch of chili heat. Finally, in a year filled with comfort food from Asia, perhaps no dish was as comforting as this bowl of soup at AS B-Dama, Old Oakland's wonderful Japanese izakaya. 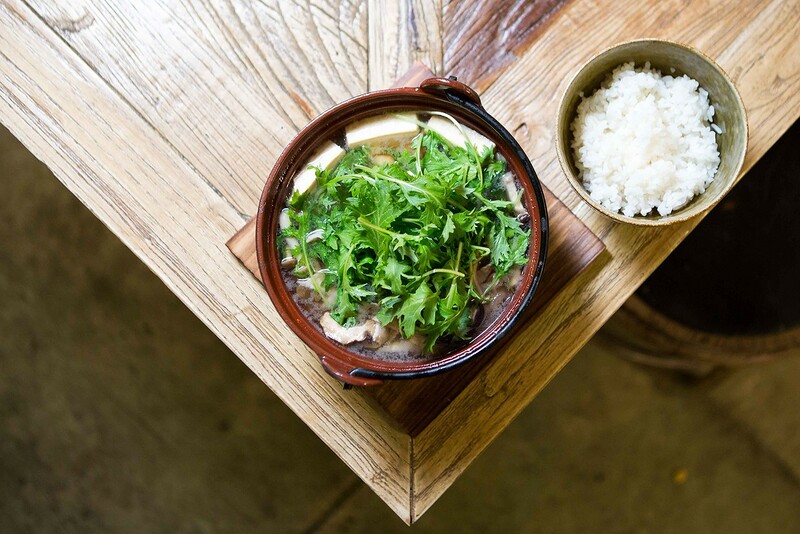 Is there anything that will warm you up like this combination of tofu, thinly sliced pork belly, mizuna, and wholesome miso broth? As long as winter sticks around, this is a dish I'll be keeping in my regular rotation. After five years reviewing restaurants for the Express, I’m hanging up my critic’s hat — at least for now. Fridays are for fish fries — or shrimp tacos, if you prefer. The popular Burmese restaurant bounces back after a health department shutdown. The Friday and Saturday dinner pop-up at The Gastropig promises elevated presentation and flavors at an affordable price, but results vary from course to course. At Tacos Oscar, vegan and vegetarian tacos shine just as bright as their meaty counterparts.